Rainy days tend to make me feel gloomy and lazy but a cute outfit always seems to brighten my mood and put some pep in my step! Feeling cute is a great motivator to get me out of the house even if it is raining out. So I threw on a simple white sweater with some high-waisted jeans and dolled it up with some fab accessories. I'm on such a blue kick lately. Is it driving you nuts yet? 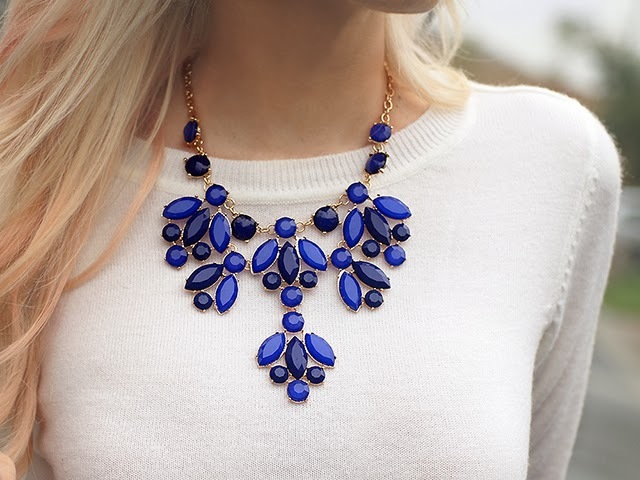 I think it is obvious why I fell in love with this blue gemstone statement necklace from Majestical Jewelry. First of all, it matches my Celine bag which seems to be a prerequisite lately but on top of that I just thought it was gorgeous! Some statement necklaces can be a bit much but I think this one is bold enough to attract attention yet classy enough to be considered timeless. Jewelry is a great way to tie in a colorful handbag or pair of shoes to your outfit. Matching a necklace to your heels or bag gives a finished and cohesive feel to your overall look. So don't be nervous about buying a new purse or pair of shoes in a bold color, just be sure to buy a few jewelry pieces to match! These pointy toe pumps with peek-a-boo plastic trim are everything! Literally every time I wear them someone compliments me on them. I wish I would have gotten them in other colors as well but when I ordered them online I had no clue I would love them this much. They look painful but they actually fit well and are more comfortable than most of my high heels. Naturally they are now sold out. Isn't that the way it always works?